Throughout Cambodia, marketplace stalls overflow with mounds of beautiful shimmering silk, meant for scarves, tailor-made shirts, dresses, jackets and chic purses. As an admirer often tempted by these lovely items, I was eager to learn more about the production process. 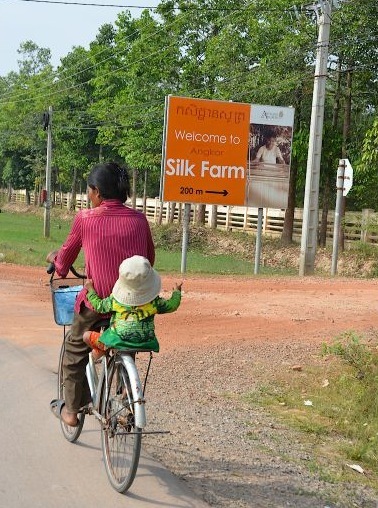 So, we hopped on a tuktuk, to travel to the Artisans d’Angkor Silk Farm, 10 miles outside of Siem Reap. 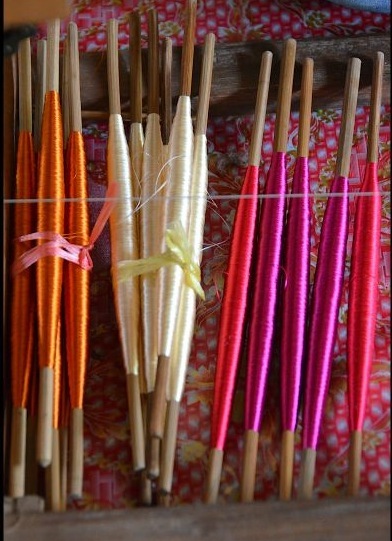 Cambodia has a long history of silk production and weaving. 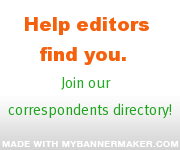 Silk worm breeding and silk weaving are believed to have been introduced there in the 13th century. During WWII, Cambodian silk production was accelerated, so silk could be exported to Europe, where there were fabric shortages. From 1975 to 1979, when the Khmer Rouge ruled, the industry suffered a great blow. Many silk artisans were killed, and those who survived were forced to produce rice on collective farms instead. In recent years, the industry has witnessed a revival. Women in rural areas customarily dabbled in silk production and weaving, when not working in the rice fields. Today, several NGOs are working to revitalize the industry, while helping to create jobs for Cambodians. Our guide, Lis, introducing us to the silk-making caterpillar, known as bombyx mori. The grown caterpillar feeds on mulberry tree leaves for three weeks prior to spinning a golden cocoon. In a mere three days, the worm can spin about one mile of thread, so it’s completely wrapped up in the cocoon! 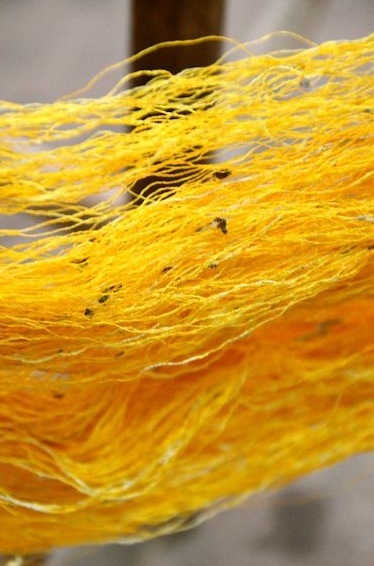 Three to ten strands must be spun together to create a single thread of commercial-quality silk. 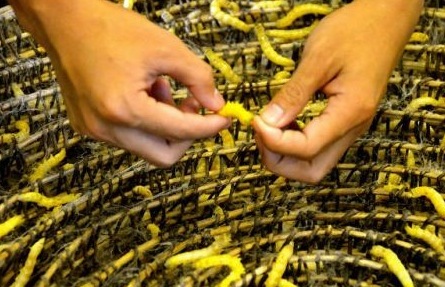 Traditionally the worms made their cocoons in bundles of branches, but today they’re placed in basket trays.Ã‚Â About 3,000 silkworms, fed by more than 200 pounds of mulberry leaves, are needed to make just two pounds of silk. The woven cocoons are boiled — with the larva inside. When I learned this, I started to feel guilty, as I calculated the number of silk worms sacrificed to make my new scarf. I was somewhat reassured when I learned that locals eat the boiled silkworms, so that at least neither cocoon nor insect is wasted. Lis offered us some boiled silkworm. Full from lunch, we declined. Supposedly, the worms taste buttery or nutty; Cambodians told us that they enjoy eating them as snacks, with beer. 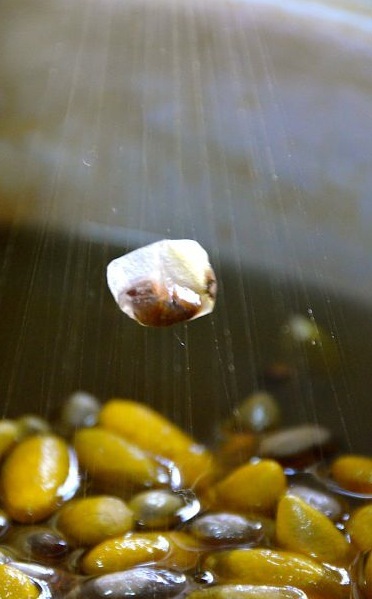 After the cocoons are boiled, the silk is carefully extracted from the cocoon. It’s then washed, twirled on to bobbins and boil-dyed, either via a natural or artificial coloring technique. 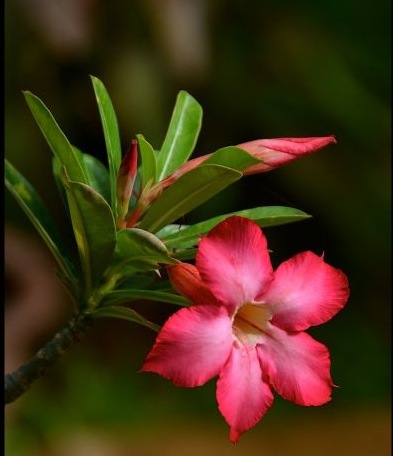 Natural dyes consist of coconut husks, various types of bark, insect nests, indigo (a tropical plant of the pea family) and other fruits. To weave the thread into fabric or a scarf, the weavers use a complicated wooden loom they power with a foot pedal, while quickly manipulating the loom’s wooden slats with their hands. It can take several days to finish a scarf. 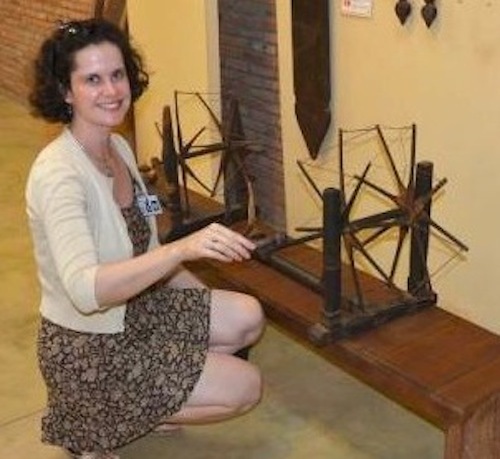 We visited a gallery that exhibited traditional silk costumes, and old-fashioned weaving equipment. 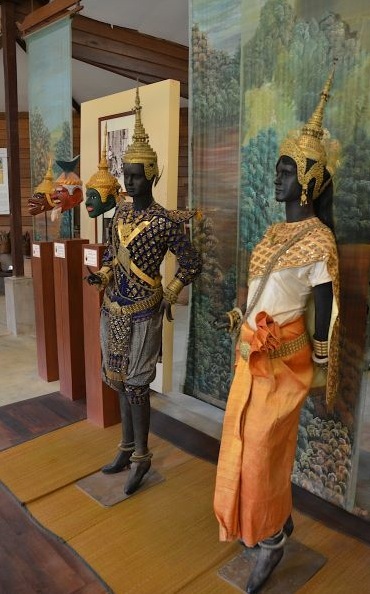 Cambodian royalty and government officials once wore a different hue for a designated day of the week. We left with an appreciation for all that goes into this craft. If only I’d had more room in my backpack for a few more silky souvenirs. Teacher and writer Tricia Mitchell, winner of the 2009 MG Keith L. Ware Public Affairs Communications award, lives in Heidelberg, Germany.